TEL AVIV, Israel, March 27, 2018 /PRNewswire/ -- Ilyon, Israel's fastest growing mobile gaming company, announced today that its flagship Bubble Shooter™ game has now passed 50 million downloads. Free to download, Bubble Shooter, is a thrilling casual app with thousands of challenging puzzles to master. Deriving from the popular 90's arcade video game, the popularity of Bubble Shooter skyrocketed when it was released as a PC game in 2002 by Absolutist Ltd. and distributed on hundreds of flash websites, giving people the opportunity to play the game wherever and whenever they like. Ilyon acquired the IP (Intellectual Property) and trademark of Bubble Shooter from Absolutist and developed the mobile version for iOS and Android with new and improved gameplay, features and graphic design. The mobile version of the game remained simple to play - featuring a classic shooter, with players needing to match at least 3 bubbles of the same color to pop the combination. 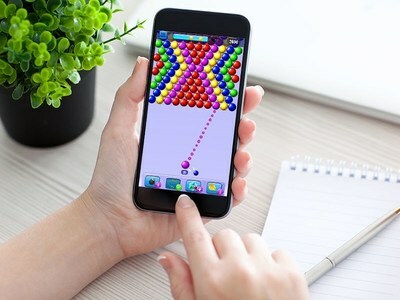 Since launching the mobile version, Bubble Shooter has become one of the most popular casual games on Google Play and on the Apple App Store, and has been played billions of times. Ilyon's Bubble Shooter includes more than 2,000 levels, with more added all the time, and great features such as colorblind mode, brand new effects and sounds, awesome daily rewards and prizes. Later this year, Ilyon is planning to re-launch the brand on the web with a new version. "The popularity of Bubble Shooter has been so exciting for our team to see and we are extremely grateful to all of our fans," said Yonatan Erez CEO of Ilyon. "While we will celebrate reaching 50 million downloads, our focus continues to remain on creating engaging, fun and exciting games for our users." In addition to Bubble Shooter, Ilyon's portfolio includes different types of casual games such as successful Match 3 and Tap 2 games. The Ilyon team includes more than 100 of the most talented professionals in the mobile gaming industry. The company's different departments - design, product development and marketing - all work together to ensure that Ilyon's global users always receive the best gaming experience. Across its full game portfolio, Ilyon has more than 300 million total downloads, a jump of over 200 million in less than a year. For a video of Bubble Shooter, click here. Ilyon is one of the fastest growing mobile gaming companies in Israel with more than 300M downloads and a line of successful free-to-play casual titles. The company was founded in 2013 by four tech entrepreneurs with a clear focus and a winning formula to take playtime to a whole new level. Ilyon is passionate about creating the most exciting and engaging gaming experience for our worldwide users, and we are continuously working to add more fun games to our portfolio.